This post contains affiliate links. Please view my disclosure for more info. Stay-at-Home Mom Problem: Going all day (and sometimes longer) without speaking to another adult. It happens. 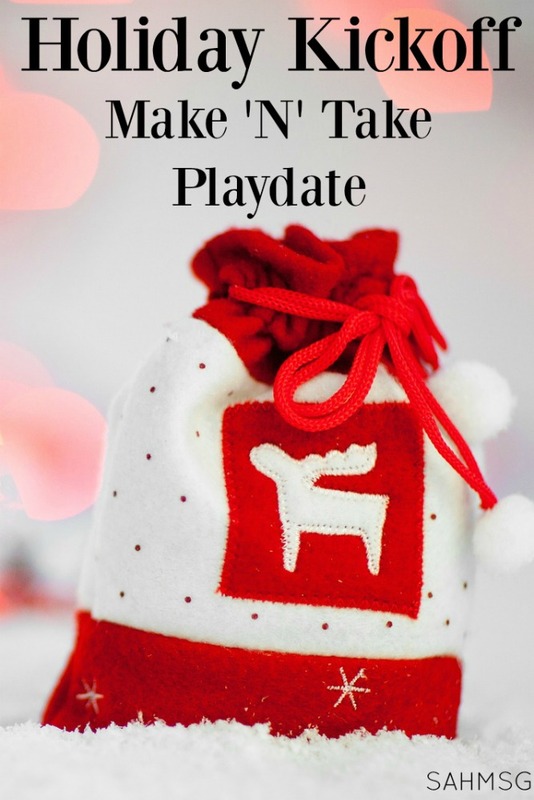 Playdates are great ways to connect with moms who are doing what you do each day-connection is important. I recently learned about the idea to host a holiday kickoff event. Our holiday planning can sometimes be overwhelming. I like asking other moms questions about how they prepare so I can learn. 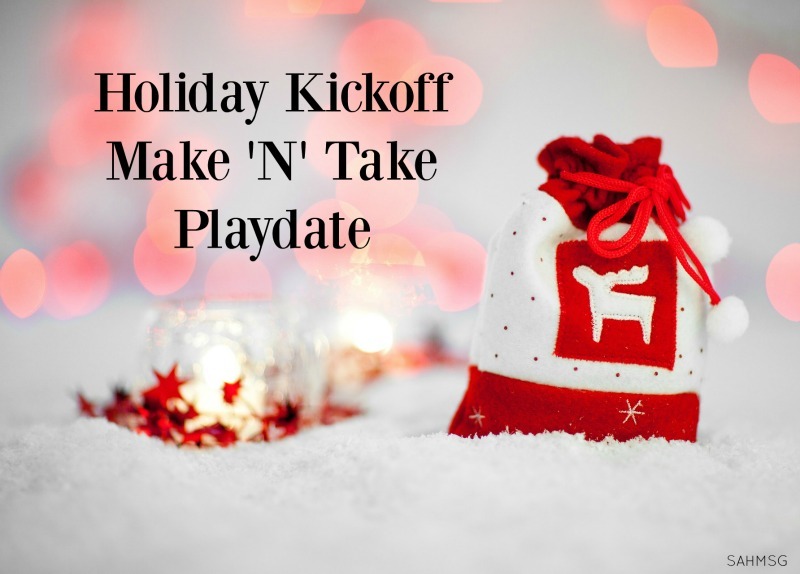 This is the why and how for hosting a holiday kickoff make ‘n’ take playdate. 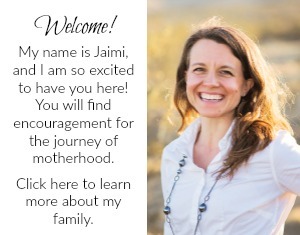 I even have a free printable invitation you can personalize. I think designing a playdate around a make ‘n’ take just makes the get together more fun for the moms. So many events we go to as moms are about the kids. This is a way to focus on us moms. I decided to invite a few moms over to get together and share our holiday organization ideas. A few of us already made a holiday planning binder at MOPS. It has been helping so much just to have everything I need for planning for the holidays in one place. This holiday kickoff event idea is credited to Marsha Ramsland. You can learn more about her in my holiday planning binder post. Since I use essential oils, I figured it would be fun to share some DIY home and beauty items I make with oils as potential DIY gift ideas. We made them as special treats for us this time. 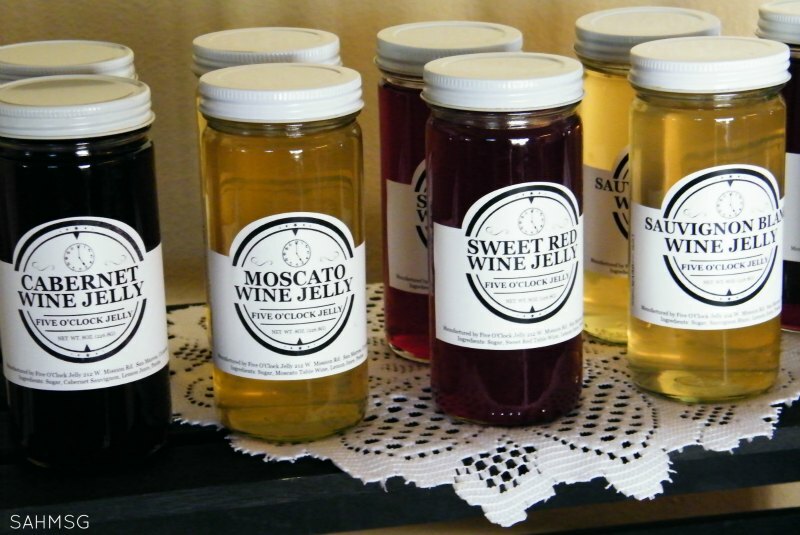 My friend Jessie, who has shared a guest post on the blog before, has a home-based business making wine jelly. (Yum!) So I asked Jessie if she could co-host the event with me so her Five O’Clock Jelly could be featured. Lucky for me, she agreed and was excited for the event! One of the No-Stress Guide to Planning for the Holidays giveaways includes 3 jellies from her collection. They are great for making Christmas cookies, using as a sauce over meatballs, or using as a quick appetizer with cream cheese as a dip for crackers. Head over to enter that giveaway and the others if you have not done that yet. I like hosting playdates at my house, but you could arrange for a clubhouse space, or use the kitchen at your church and that would work great for a make ‘n’ take location. 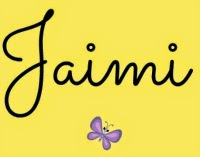 You can download and print my invite template and fill in your info in the designated areas. Just highlight and delete my wording, or keep it if it works for your event. Add in the RSVP details and save it before sending to your friends. 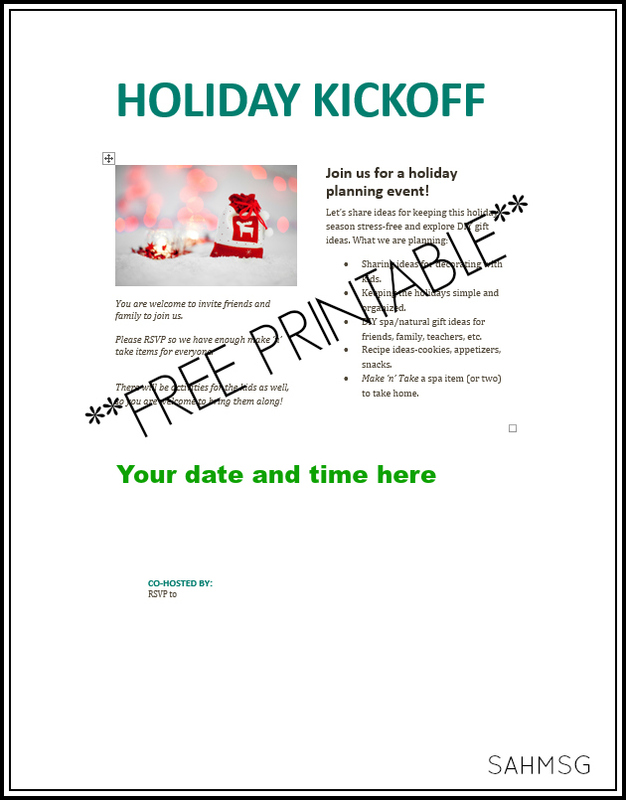 Many word processing programs have invitation templates that you can customize easily too. For me this was easy because I have only lived in California for a year, so my social circle is not large. I invited the moms who sit at my table at MOPS plus my friend Jessie who is a fellow military spouse. I like email because it saves paper, everyone seems to have a smart phone, and usually people can reply relatively quickly. You certainly could create invitations to mail out. That would be a really nice touch! Plan food and kids activities. I keep the kids activities really simple. 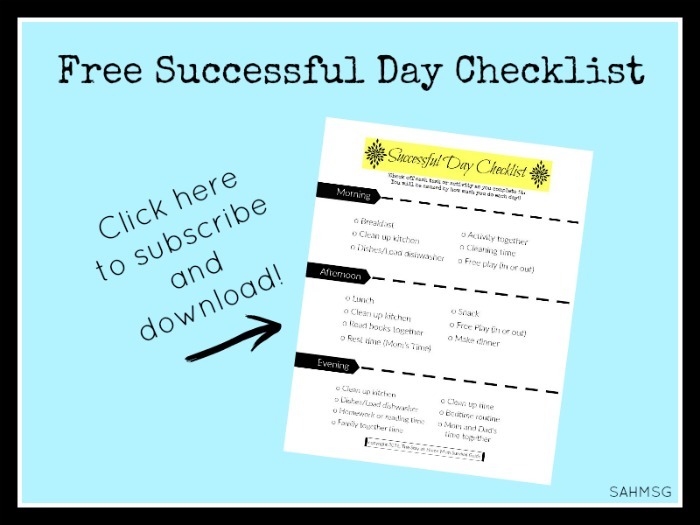 The kids usually occupy themselves pretty well, so I don’t create busy bag or table activities for my playdates. We have a small bounce house that we bought the kids as a joint birthday gift 3 years ago. It has been the absolute best toy we ever purchased! I set that out when we have a group of kids over. Other than the bounce house, I usually have Crayola Color Wonder markers and Color Wonder paper on-hand. That way I don’t have to be so focused on the little kids coloring in the wrong place. My friend brought the bulk of the food. Jessie brought her wine jelly/cream cheese appetizer, meatballs with wine jelly sauce, and jelly thumbprint Christmas cookies. Her jelly really is so versatile! I provided simple drinks like my new favorite natural energy drink, water, coffee, tea-the staples. It worked. It happens. People can’t show up. It can be hard to get excited for an event and then have people not be able to attend, worse they could say they are coming and not show up! (I have had that happen too.) Just appreciate the friends who do show up. Don’t worry about numbers. 1. Purchase supplies like glass jars, lip balm containers and metal spray bottles, shea butter, coconut oil, beeswax, etc. 2. Plan how you are going to set up the stations. 3. Type up and print off recipe cards for each station. I typed the recipes, printed them, glued them to cardstock and laminated them. 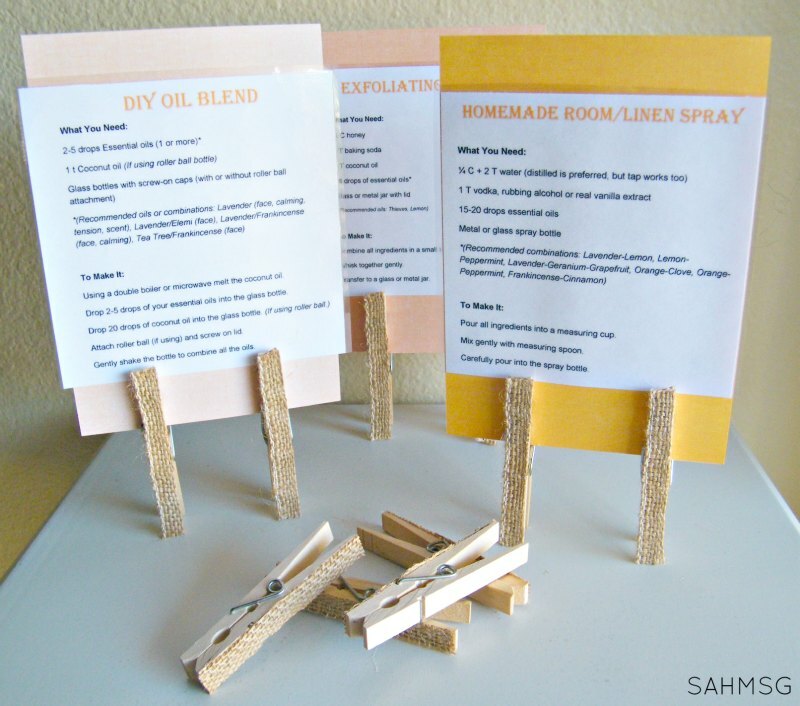 After adding some strips of burlap to clothespins with hot glue, I had little stands for each recipe card so they were easy to read. 4. Gather festive placemats, cloth napkins, or scrap pieces of fabric to use as placemats at each DIY station. The day before the event prep your base for any lotions or lip balms. This was a genius idea I found on Pinterest so I always have my shea butter/coconut oil lotion base ready for adding oils. 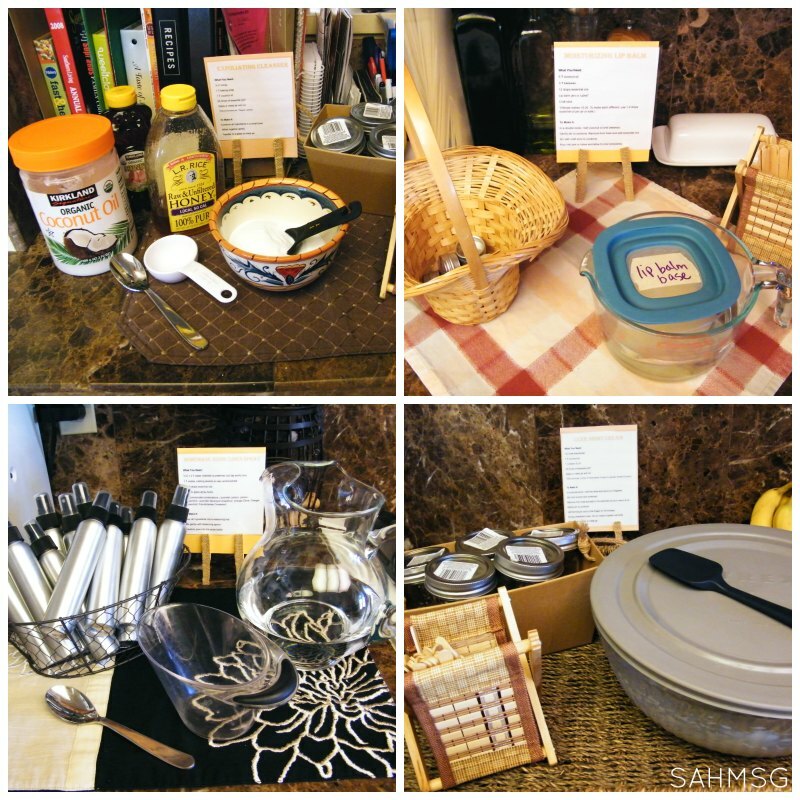 The day of, quickly declutter and get organized fast, then set up your DIY Make ‘N’ Take stations where you have space. You can see in the photos I set them up in the kitchen. They needed to be accessible and out of the reach of little hands! Enjoy your holiday kickoff event! I received nice comments about the holiday kickoff make ‘n’ take playdate. We shared some ideas for giving gifts-this is so helpful for the difficult-to-buy-for folks or if you are just not very good at gift-giving (like me)! It was nice to just to get to know a couple of ladies better. I will be sharing all the DIY gifts we made at my holiday kickoff make ‘n’ take playdate over the next couple of weeks. 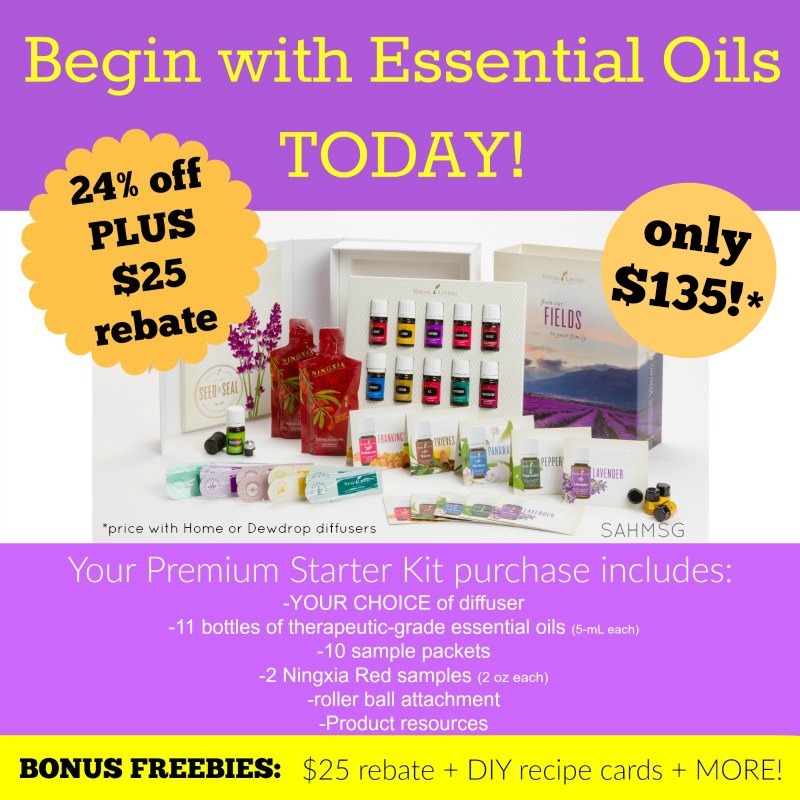 They are really inexpensive ways to maximize your essential oils, give gifts that are useful, and maximize your budget. Want to start gathering DIY gift ideas for your friends and family? The 12 Days of Christmas DIY Gifts event on Facebook is going on now! I will be sharing my favorite oil on Saturday, November 21st , so stop by and check it out. Do you make or buy gifts for Christmas? What are your tips for planning for the holidays with kids?